If there is one area of the beauty world I love, its skincare. I love reading about it, learning about it and most of all trying it! 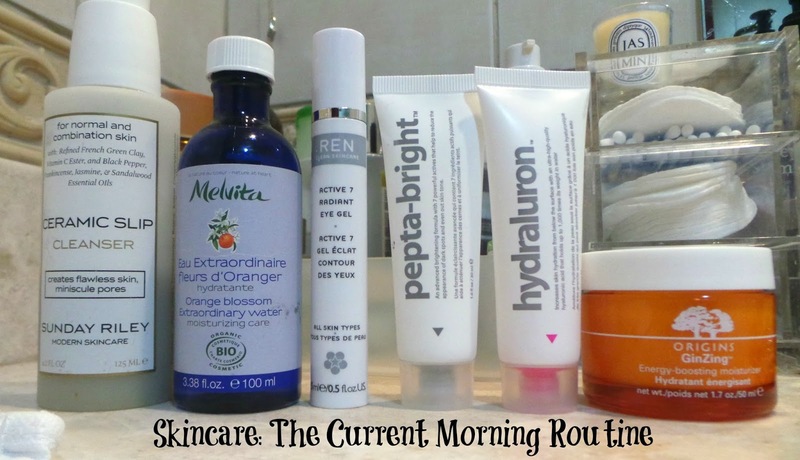 Here's what products I am currently using in my morning routine-for the record I am 34 (eek) with fair, combination skin. My main concerns are open pores round my noise, the very occasional cystic spot and holding back the aging process as much as possible!! I have learned over the years that my face doesn't tolerate cocoa butter and isn't a big fan of products containing lavender and lots of beeswax or shea butter. I chop and change my skincare, rarely staying loyal to anything-and will discard anything I hate or my skin doesn't seem to like. At the moment my skin is good and clear-but there are some products in my current routine I love and some I probably wouldn't repurchase. My morning routine is currently cleanse, hydrating tone, eye gel, serum, hyluronic acid, moisturise before I start slapping on the make up! Cleanse: I am currently using the much hyped Sunday Riley Ceramic Slip. I dampen my hands when I step in the shower, pump the cleanser into them and apply to dry skin before washing off under the shower. It washes cleanly with no residue. This cleanser is light and non drying and full of skin pleasing ingredients such as French green clay to draw out impurities and Vitamin C to reduce discolouration and stimulate collagen production. Sandalwood combats sensitivity, black pepper promotes circulation and jasmine soothes. It's pricey at £35 but I would repurchase. Hydrating tone: I double tone every evening but in the morning I just use a hydrating toner and I am currently using the Melvita Orange Blossom Extraordinary Water. This toner has a gel like consistency and I swipe it over my skin with a cotton pad. It's not sticky despite the consistency and dries almost immediately. I don't feel a huge amount of benefit from using this and it sometimes leaves my skin feeling a bit tight. Am coming to the end of the bottle and this would be something I would not repuchase. Eye gel: I am currently using the Ren Active 7 Radiant Eye Gel which is a clear, light gel which feels cooling and soothing. It claims to brighten and tighten but sadly I don't feel any of those effects-the Estee Lauder Idealist eye cream (which I was using prior to this) is far more brightening. It does make a good base for make up but again, not something I would repurchase. Serum 1 and 2: I do like a serum in the morning. I had used the Hydraluron before and thought it was ok but nothing spectacular. Then one day I was reading Sarah's morning routine and she was using the Peptabright and Hydraluron together-and loving the result. I had a tube of both in my stash so for the past few weeks I have been applying first the Peptabright (to even skintone, brighten and fade old scars) and then Hydraluron (a shot of hyaluronic acid for your skin for plumpness and hydration). Whilst I don't think the Peptabright brightens noticeably (I rely on my Chanel Sheer Illuminating Base for that), it does even out the skintone and the Hydraluron is a great compliment to it. As a result I need less moisturiser and my make up is definitely lasting longer and looking fresher. Moisturiser: A beauty bloggers fave, I am slowly making my way through a pot of the Origins Ginzing. And what's not to love? The perfect moisturisor for summer-light, cool, hydrating-my skin just drinks it up. Described by Origins as an energy drink for the skin, it is packed with Ginzing and Caffeine. Something I have noticed-this moisturiser used to have a tint to it-I am sure it did. The eye cream definitely does. Now it doesn't has the same slightly metallic-y tint which is better but you don't see as much of an instant brightening effect to the skin as you do with the eye cream. I will follow this up with my evening skincare routine tomorrow! Do you use any of these products in your am routine? Hey Stacey, I haven't tried ANY of these! I've always wanted to try Hydraluron though. Maybe when I run out of my second bottle of Caudalie Vinosource SOS, I'll replace it with Hydraluron! I love this post! It sounds as though we have very similar skin (I'm also 34!) I'm going to try buying that Peptabright...I have the hydraluron but sometimes it's just a bit, well, hmmmmm isn't it! Oh well the perks of spending Sunday in bed! Like you, I love seeing what everyones been using on their faces :-D And me too, heading towards the mid thirties like you, obviously pay a bit more attention to skincare. So seeing your Ceramic slip cleanser got me real excited cos I am looking for something nice myself, and I have been eyeing this. And what do you know! We even have the same skin type! Yay!